Many of the restaurants in Chicago take it to the next level for Valentine's Day. They offer special prix fix menus, have limited seatings, and fill up all of their reservations weeks in advance. It was the same story of The Boarding House; luckily, we had a reservation! This restaurant has had mixed reviews ever since it opened. I had heard great comments about their wine and cocktails, but just mediocre reviews on their food. Everyone kept saying it was hit or miss. I am unsure if they stepped it up for Valentine's Day, but my girlfriend and I both loved the food and service. They had a very diverse menu with a dish for everyone. And their cocktails were definitely some of the best. The price is expensive, so that knocked the rating just a bit. But the atmosphere made up for it. The dark dining rooms were brightened by huge chandeliers made of wine glasses and old glass water bottles. And, with an elevator to the top dining room, something just felt more special. I will say, since we didn't come on a normal night, my review may be a little biased... but for Valentine's Day dinner, it was an easy 4-mile rating in my books. To start off our Valentine's Day dinner, we ordered a couple of their Love Potion Cocktails. It was an interesting spin on the bellini. Unfortunately, I forgot the fruit puree they used (something that reminded me of a strawberry), but it had champagne and a twig of rosemary. It was surprisingly very sweet and refreshing. I enjoyed it, but whiskey was definitely going to be next. With only two options for the first course, we decided to order one of each to try. My girlfriend ordered the crab bisque, which was 100x better than the beet salad (seen below). 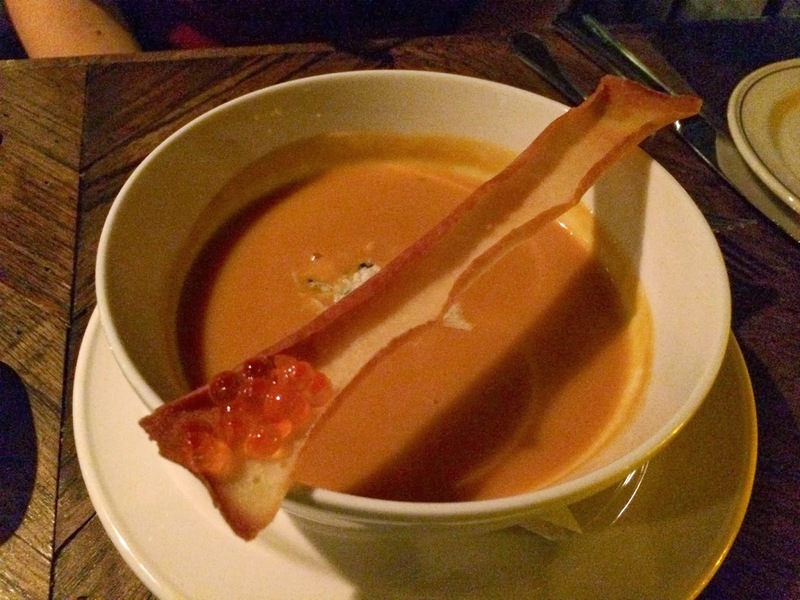 Her soup consisted of a creamy crab bisque topped with lump blue crab meat, a ginger tulle, and a scoop of salmon roe. Being a bisque style soup, we expected a creamy, rich soup... but that is an understatement. It is as rich as most lobster bisques, but also had a lighter touch with the flaky crab meat. The ginger tuille is meant to be broken into several pieces, giving the soup a little crunch at first. I thought the salmon roe was over-the-top and unnecessary. It didn't add anything except for a salty bite, but it didn't harm anything either. I loved the bisque and would order it time after time again. My first course was the vegetarian option for an appetizer. 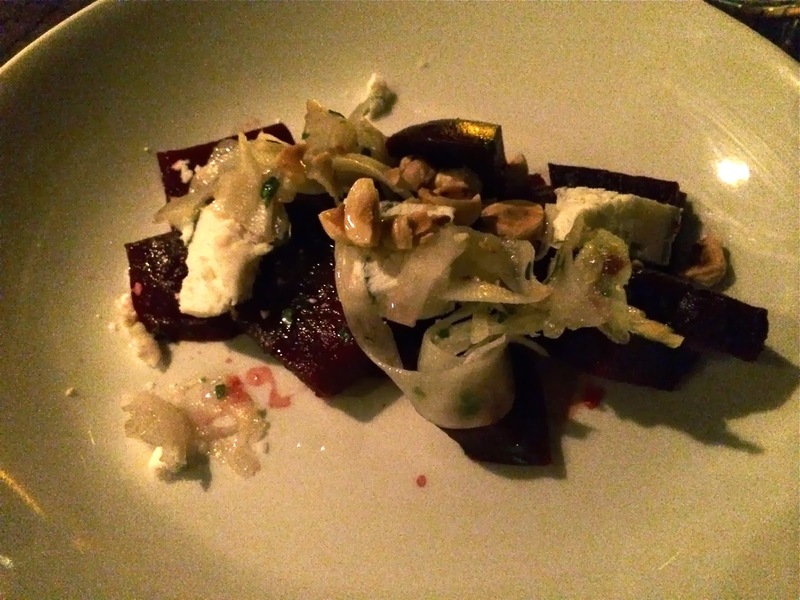 It was a roasted beet salad topped with blood orange slices, fennel, goat cheese, and toasted macadamia nuts. Personally, I didn't like the salad too much. The beets had a nice consistency, but lacked flavor whatsoever. Luckily, the goat cheese and macadamia nuts somewhat salvaged the dish. In hindsight, I wish I wasn't adventurous and I wish I didn't try this dish. We were both expecting more palate-cleansing type dishes for the second courses, but instead encountered this surprisingly rich dish. 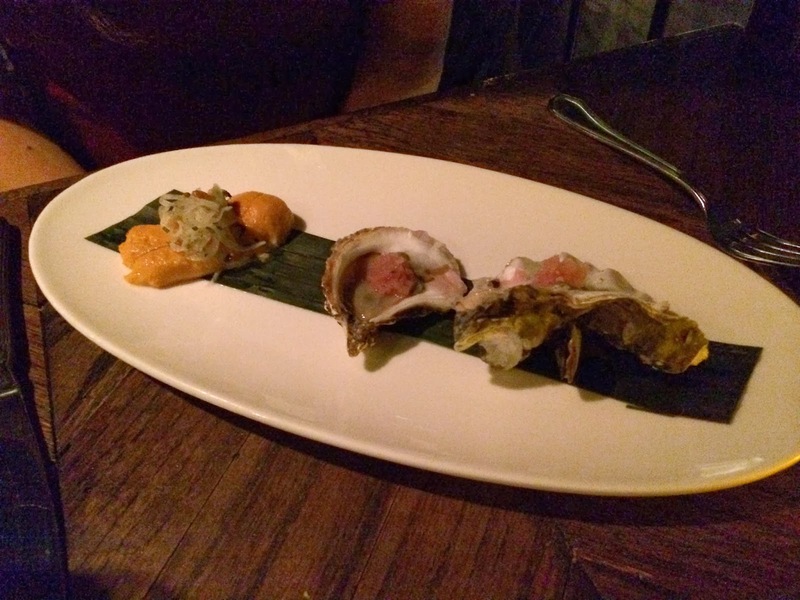 The oyster and uni is exactly as the name describes and was served mignonette style. Each mignonette was made with either oyster or uni and was topped with pickled onions and crushed pine nuts. They reminded me of oyster shooters, but much more deep in complexity and richness. The uni itself was super creamy, so that pickled onion was much needed. Honestly, I could eat a dozen of each of these, and just wished it came with more! Seeing foie gras on the menu, it was a no brainer for my second course. 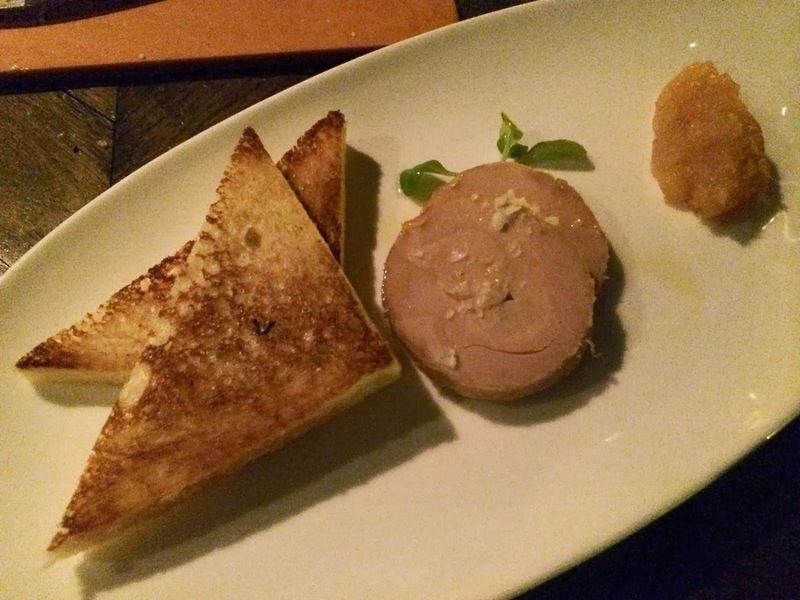 Here, the foie gras torchon was cut into two circular disks (torchon preparation) and served alongside brioche toast points and a quince compote. Out of all the dishes, it was my favorite of the night. This was was some of the richest foie gras I have ever eaten, with that silky, fatty texture taking over my palate. The brioche was a delicate enough bread to let the foie gras shine. The quince compote reminded me of a homemade apple sauce, which is a much needed accompaniment. It acts to help cut the fattiness and actually bring out the flavors of the foie gras even more. Absolutely amazing! Another no brainer was her choice of lobster for the main course. They prepared the dish by butter poaching the lobster and serving it along side a mixture of baby carrots, heart of palm, and a fregola-like grain/pasta. The sauce was a carrot ginger buerre blanc. The first thought that came to mind was the size of the entree. Wow, they literally gave an entire lobster (de-shelled), and even mixed more lobster into the pasta. The lobster was cooked perfectly... tender, yet held its shape nicely. I thought the pairing with carrots was on the interesting side because of the stronger flavors of the carrot. But, it went very well together. I wasn't sure what the garnish was, but I didn't like it at all... it had a weird vinegar flavor to it and was simply unpleasant. For my main course, I stuck with the one meat option they offered. And, it was a good one. 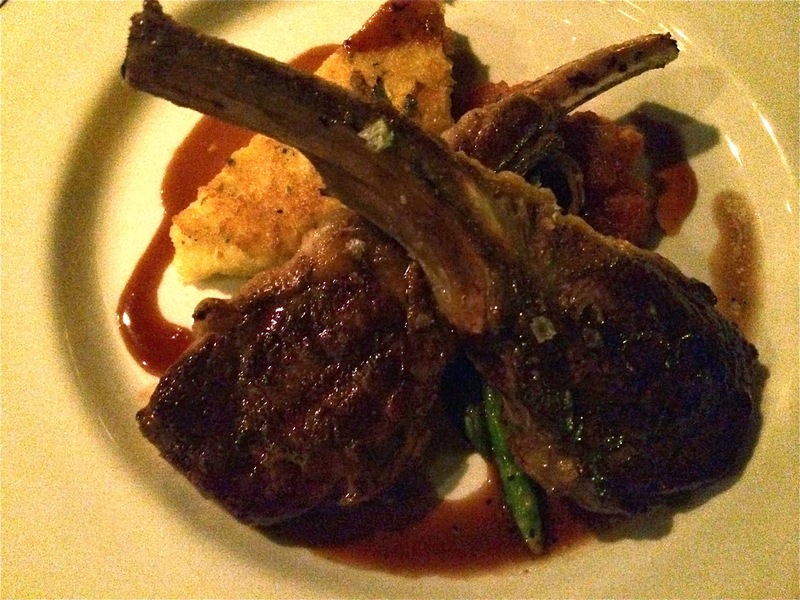 Two lamb chops sat on top of grilled asparagus, a tomato jam, and a crispy polenta cake. The dish was a step up on the typical meat and potato style dishes every is accustomed to. The lamb chops were grilled to a medium rare with a nice thick pepper crust add tons of flavor. The juices ended up flavoring the asparagus and also was soaked up by the polenta cake unifying the dish even more. The tomato jam added some sweetness, but honestly, if it wasn't there... I wouldn't miss it. In fact, I didn't even realize the jam was there until after the first chop was done. Tender meat and huge portion... can't do much better than that. For dessert, they didn't make us choose between several options. Instead, they gave us a collection of the Valentine's Day specials. 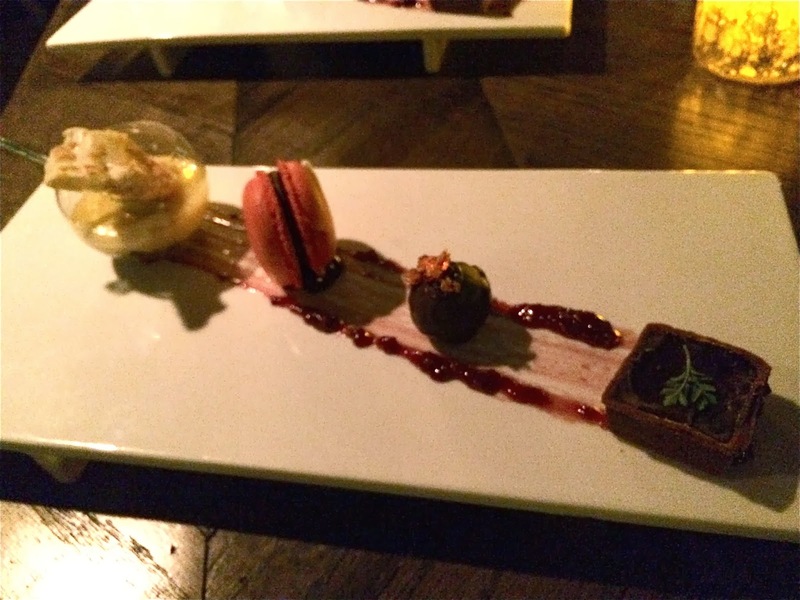 The dish came with, from left to right, a passion fruit pudding, a strawberry macaron with chocolate filling, a blood orange truffle, and a dark chocolate brownie. Three out of the four were unreal, while the last I would not eat again. My favorite was the macaron--a clever twist on a classic dessert. The cookie was strawberry and the filling was chocolate in this case, and honestly, I was completely fooled into thinking I was eating a chocolate-covered strawberry. My second favorite was the blood orange truffle. It was creamy and chocolatey, just be careful with that hard rock candy garnish. The passion fruit pudding had an interesting cocoa puff-like component on the bottom. Unfortunately, the fourth component, that brownie, was dry and flavorless. Almost perfection, but not quite there. The Boarding House has some of the greatest names for their cocktails. Ours were "Grow a Pear" and "Curl up & Rye". Both were great mixology style cocktails featuring interesting mixers. The pear cocktail consisted of gin, pear brandy, sage simple syrup, and ginger beer. It was a very summery drink and very refreshing. 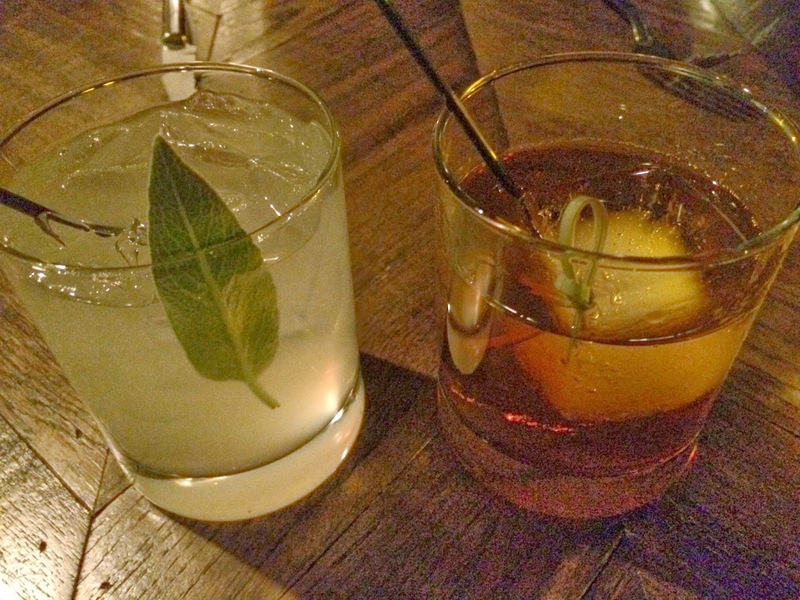 The whiskey cocktail was made with rye whiskey, St. Germain, and Punta e Mes. The last two ingredients was an elderflower syrup and a type of bitter. I enjoyed the whiskey cocktail, but would prefer a sazerac next time. - Valet parking is only $12.00 (much better than most of the city). Definitely worth it since dinner takes around 2.5 - 3 hours if you order multiple course. - Make reservations! Sitting upstairs on the 3rd floor or 4th floor loft is amazing. The dining room is more intimate and quiet, unlike the first floor bar. - Don't expect a cheap dinner. The restaurant is pretty expensive, so just keep that in mind. The drinks add up real quick.